The idea behind Play Design Hotel is to connect international travelers with Taiwan indigenous culture, as well as to help Taiwan designers connect with international lodgers; both of them will collaborate physically and virtually in shaping the meaning of design and hotel. Led by our designed experiential means—from online booking to in-room engaging—the lodgers will actively and profoundly interact with Taiwan design furnishings, and to explore the concept, story, and quality of indigenous culture via selected design works. To put it bluntly, the hotel becomes a platform for not only showcasing indigenous design, but also having indigenous designs being experienced by foreign travelers who are interested in Taiwan Design. Play Design Hotel marries design and hotel with the most harmonious way, as well as the relation between local and foreign culture, between designer and user. Transforming a hotel into an inhabitable design gallery, Play Design Hotel innovates hotel industry in terms of interior space and its service operations. Lodgers’ demand for design tourism has arisen when they have intimate contact with indigenous design works, and when the hotel holds an authority to recommend indigenous travel landscapes to lodgers, and to realized a co-created meaning of the hotel space. In September 2015, we have further launched an ambient travel clock, a domestic digital furnishing that promote design-related places to visit in Taipei aside from lodging. Play Design Hotel joins both design and hotel industries together, transforming hotel from an entertainment or business centric value into an interpreter portal for indigenous travel experiences. This transformation has significance for Taiwan. Since Taiwan’s international status has been in limbo for the rise of China’s economic power, and the ideological tension between Taiwan and Mainland China. This situation also causes identity crisis for the people in Taiwan. Taiwan has spent decades trying to resolve the political tension with neighbor countries. Young Taiwan designers also face and reflect the same issue through their design creation. Only when people in Taiwan start to put down and let go the controversial national identity caused by the history and embrace the island’s unique multicultural value, we will then be able to understand and appreciate the true value and living in this island. Play Design Hotel has proposed a model for experiencing and recreating Taiwan’s cultural value. Through wood-making, metalworking, or cement manufacturing, new generation of Taiwan’s indigenous designers can not only let Taiwanese people regain its cultural identity, but also enable travelers from around the world rediscover Taiwan’s cultural value. Play Design Hotel (PDH) does not join the fashion of “Design Hotel,” it redefines the meaning of “design” in a “hotel” instead. In PDH, design is a personalized and genuine experience, not only a stylish item or aesthetical mode. We center on design in the hospitality experience, and further use indigenous design works to communicate lodgers with local culture and design community. By transforming hotel rooms into an inhabitable design gallery, it also transfigures a hotel from an accommodation particular for customer-first services, ornate decorations, a variety of facilities, and star-rating criteria, into a new set of interior and service strategies. In PDH, an interior space does not signify a variety of equipment or facilities, but recreates the meaning of a space featured by each indigenous design item. In so doing, the hotel becomes a dynamic space manifesting different meaning in accordance with the constitution of furnishing items. The innovative ideas on recreating the meaning of interior space and service concept make hotel become one of experiential destinations for the travelers. They can expect to experience something different than ordinary stay. This changes the way a hotel operates, and has redefined the organization, configuration and function of a hotel. PDH transforms hotel into a marketing platform that brings local design to international travelers by letting them stay in a room furnished with indigenous design, and enabling them to explore, learn, and shop indigenous design during their stay. With the innovative operations of the space and the service in hotel industry, PDH differentiates itself with other traditional hotels and has succeeded in business. Why incubating and marketing Taiwan Design? Because we hope to see the experiences and energy accumulated from manufacturing and technologies in the past decades could transform as crucial resources for indigenous designers to create design ideas. Driven by the need to transform, Taiwan’s manufacturing power and technological resources will be inherited by contemporary designers. The two generations can work together to co-create in a vibrant industry ecosystem for reasonable profits and benefit mutually, and not to be a victim of labor exploitation dominated by capitalist system. We have discovered a new way for incubating Taiwan Design – through field research, building prototype, exhibition, marketing and selling indigenous designs in PDH. This entrepreneurial project has shown the possibility to employ strength or characteristics from different industries, through rethinking the conventional way that each industry thinks and works, and thus to overcome difficulties faced in a certain industry. We see the opportunity lies in looking into the problems in industry ecosystem level and identify innovation opportunities for entrepreneurship. By doing so, the effect could be huge. PDH also manifests the aggressive role of hotel in functioning as a country’s portal, fostering the development of domestic industries or bridging the gap between local and international business landscapes. It explicitly shows that the hospitality industry can recreate its value system from a capitalist and materialistic viewpoint to a more social responsible investment that benefits industry environment or fosters cultural development. What kind of space would be best for design furnishings to be used and experienced, and to further demonstrate and market the quality of indigenous design? We found the answer lies in hotel industry. Hotel is a space with high flexibility and fluidity and has undergone a transformation. Modern hotels have genuinely adapted to rapid social changes with creative solutions: from rethinking guestroom configurations to ensuring highly personalized experiences. Play Design Hotel takes a step further to reimagine hotel space as a dedicated space for the collaboration of design, traveling, indigenous culture, and daily life experience. It is a place for lodgers spending at least one night, and also intimately experience the furnishing items in it; for travelers who look for indigenous experience, indigenous design furnishings will provide local cultural engagement. Hence, we have realized the idea to transform design exhibition spaces into hotel rooms and vice versa. We tend to enable design works to be experienced in the form of “living” and to demonstrate their values through hotel customers’ personal experience. By the same token, we seek to make hotel a portal and best interface for travelers to learn about and engage in a country’s indigenous culture. By transforming hotel rooms into an inhabitable design gallery, it also transfigures a hotel from an accommodation particular for customer-first services, ornate decorations, a variety of facilities, and star-rating criteria, into a new set of interior and service strategies. In Play Design Hotel, an interior space does not signify a variety of equipment or facilities, but recreates the meaning of a space featured by each indigenous design item. In so doing, the hotel becomes a dynamic space manifesting different meaning in accordance with the constitution of furnishing items. 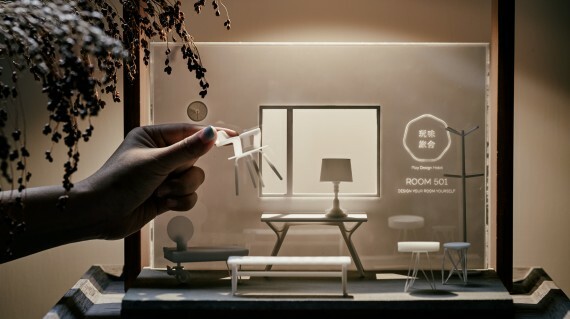 We have introduced “The Theme Room” and “The Guest Selection Room” as the two interior strategies to innovation: Theme Rooms are curated under a main theme: Perspectives for Taiwan Design. These rooms are the assemblage of indigenous furnishing items, including table, chair, tea table, side table, coatrack, clock, stand lamp, pendant lamp, and desk lamp, to name a few. These rooms are sub-themed as Made in Taiwan 3.0, Award-winning Collections, Crowd-funding selections, Maker Room, et cetera. The rooms are curated by the selection team in hotel, and invited local designer or curator. Guest Selections Room is open for lodgers to curate their own theme. Lodgers are encouraged to select furnishing items through online booking process via our specially designed web interface, and we will furnish the room accordingly before his/her arrival. The lodger will see the special-curated items appeared lively in the room. The two interior strategies are the innovative ideas on enhancing the localized and personalized guest experience, by the co-created hotel with lodger participatory design. This innovative strategy enriches the meaning of the space and its relations to the lodger, rather than offering a compromised balance among style, amenity, and price. For the lodgers, hotel space thus becomes not only a space for sleeping but more of a space of meaning.